Puto maya is steamed glutinous rice flavored with coconut milk and ginger. 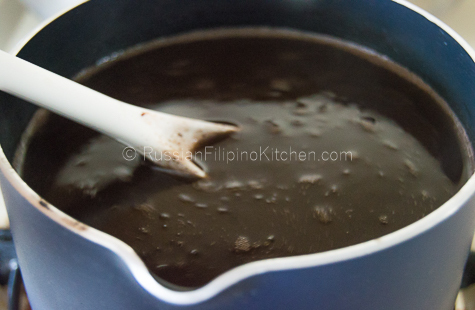 Mildly sweet with a hint of saltiness, it’s a popular breakfast item in the Visayan region of the Philippines usually paired with sikwate (hot chocolate made from pure cacao and brown sugar) and/or ripe mangoes. They’re often wrapped in banana leaves and shaped like triangles. 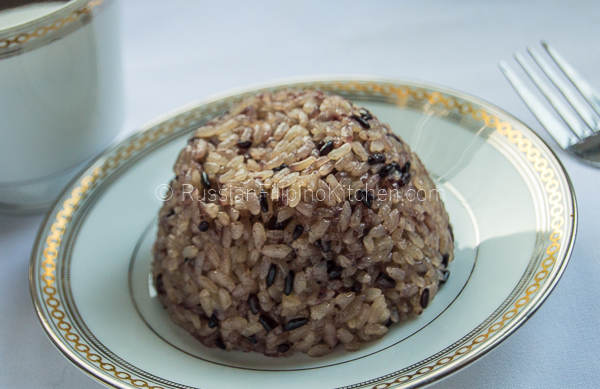 Puto maya can be made from plain sticky rice (pilit) or with a combination of black sticky rice (tapol) to give it that speckled look. You’ll find them sold during early mornings in food stalls in many wet markets all over the region and also in small eateries. But the best way to go is make puto maya at home so you’ll have lots of leftovers to reheat for later. 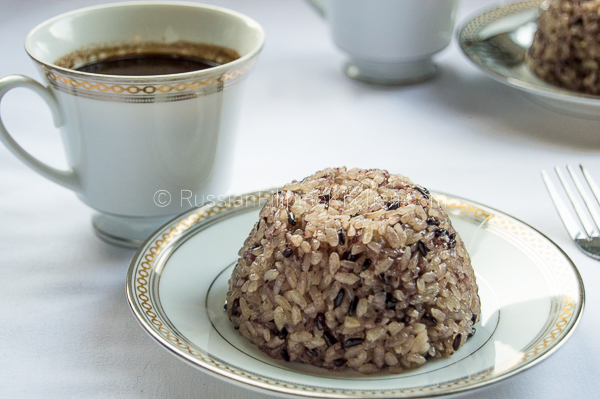 This puto maya recipe uses a combination of white and purple sticky rice and uses canned coconut milk since I don’t have access to fresh coconut milk. 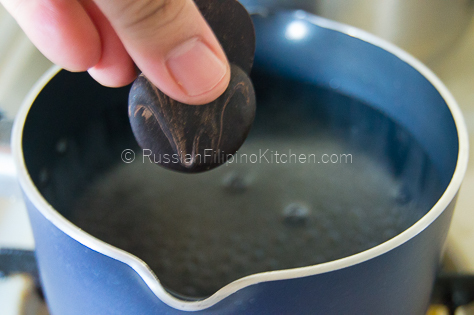 As for the sikwate, I use pure tableya (round chocolate discs made from toasted pure cacao beans) from Philippines that a good friend has sent over last Christmas. 1. 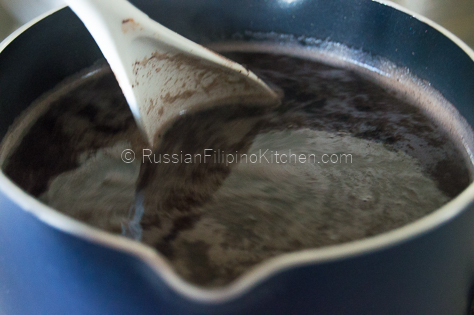 Soak black glutinous rice in water overnight. It helps soften the grains and makes cooking faster. If you don’t have time to pre-soak, boil the rice in 2 cups water and simmer on low heat for 30 minutes. 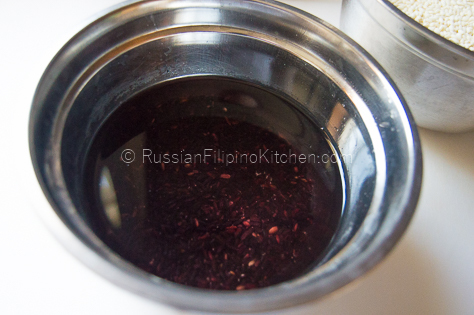 For this recipe, I pre-soak the black rice overnight, hence cutting cooking time by 30 minutes. 2. 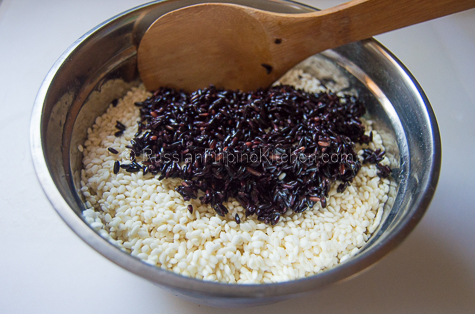 Rinse black rice with cold water to remove most of the purple color. 3. 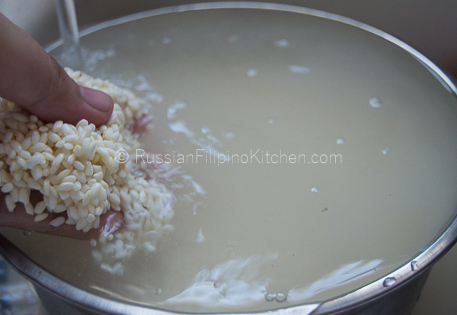 Rinse white glutinous rice with water to remove impurities. 4. Mix both rice in a mixing bowl. 5. Peel ginger and slice into strips. 6. Add water to steamer and add the steamer basket. You’ll need a steamer with tiny holes, otherwise you need to line the basket with banana leaves or cheese cloth so the rice grains don’t fall through while cooking. The steamer I use has tiny holes so I don’t need a liner. 7. Add the rice and ginger into the steamer. Spread them evenly using a spatula or cooking spoon with a flat end. 8. Turn on stove and set dial to high. Cover steamer and bring to a boil. 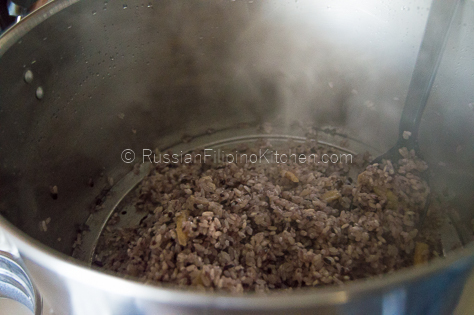 Once boiling, lower heat to medium low and let it steam for 45 minutes, mixing the rice every 10 minutes or so. 9. Meanwhile, in a mixing bowl, mix the coconut milk, sugar and salt. 10. 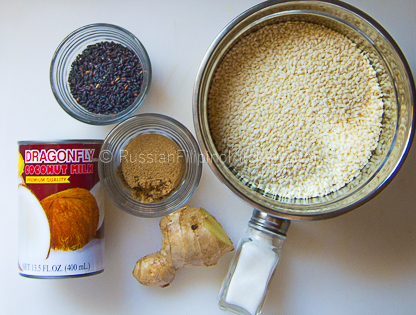 After 45 minutes, sprinkle rice with coconut milk mixture and mix thoroughly until evenly distributed. At this point, the rice is still not done. You’ll know by looking at the white grains. Uncooked grains still looked milky white and still nutty when you bite it. 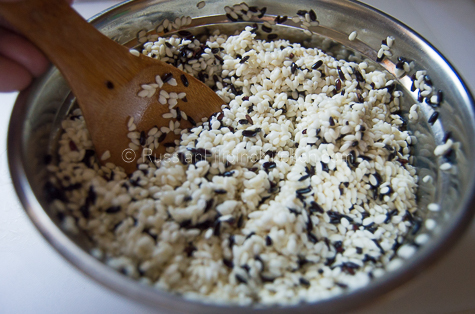 For black rice, you can tell by biting the grain. If your teeth won’t sink in, it still needs further cooking. Check the following photo. 11. Cover steamer and continue cooking for additional 30 minutes until rice is al dente ((just cooked, soft to bite but not mushy), mixing every 10 minutes. 12. Serve with sikwate (hot chocolate), ripe mango, or salted dried fish. 1. Bring to a boil 3 cups of water in a sauce pan. 2. Add the tableya and lower the heat to medium low. Use a whisk or cooking spoon to stir and break down the chocolate discs. 3. Add brown sugar and keep stirring till there are no more visible clumps. 4. Pour into individual cups and serve hot. 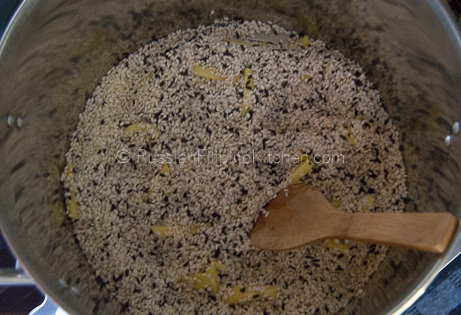 Soak black glutinous rice in water overnight. It helps soften the grains and makes cooking faster. If you don’t have time to pre-soak, boil the rice in 2 cups water and simmer on low heat for 30 minutes. 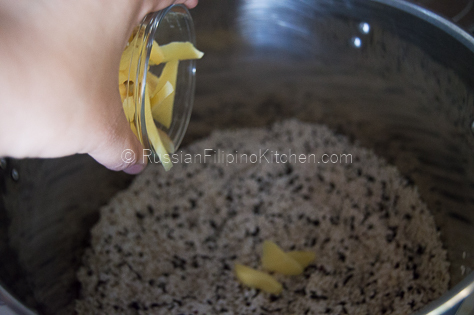 For this recipe, I pre-soak the black rice overnight, hence cutting the time in cooking by 30 minutes. 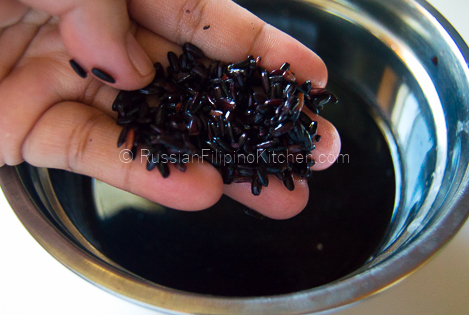 Rinse black rice with cold water to remove most of the purple color. Rinse white glutinous rice with cold water to remove impurities. Mix both rice in a mixing bowl. 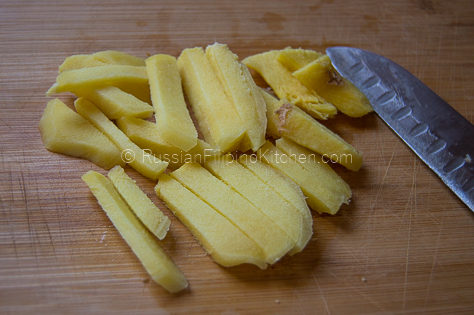 Peel ginger and slice into strips. Add water to steamer and add the steamer basket. You’ll need a steamer with tiny holes, otherwise you need to line the basket with banana leaves or cheese cloth so the rice grains don’t fall through while cooking. The steamer I use has tiny holes so I don’t need a liner. Add the rice and ginger into the steamer. Spread them evenly using a spatula or cooking spoon with a flat end. Turn on stove and set dial to high. Cover steamer and bring to a boil. 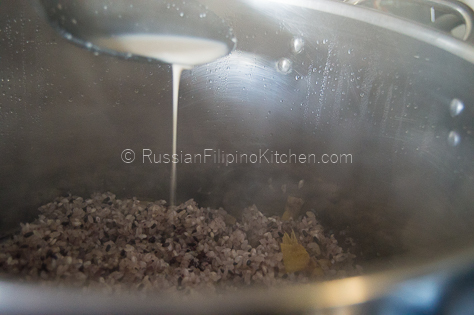 Once boiling, lower heat to medium low and let it steam for 45 minutes, mixing the rice every 10 minutes or so. 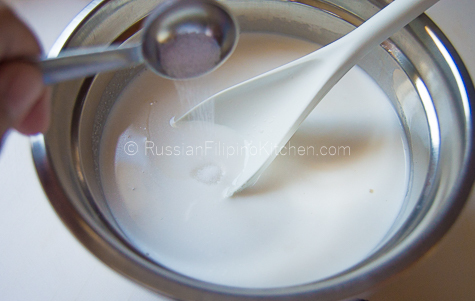 Meanwhile, in a mixing bowl, mix the coconut milk, sugar and salt. 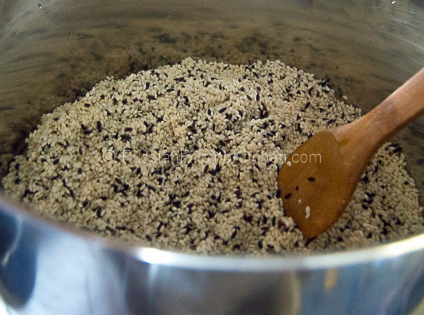 After 45 minutes, sprinkle rice with coconut milk mixture and mix thoroughly until it’s evenly distributed. At this point, the rice is still not done. You’ll know by looking at the white grains. Uncooked grains still looked milky white and still nutty when you bite it. For black rice, it will be hard to bite. Check the following photo. Cover steamer and continue cooking for additional 30 minutes until rice is al dente, mixing every 10 minutes (just cooked, soft to bite but not mushy). Serve with sikwate (hot chocolate), ripe mango, or salted dried fish. Bring to a boil a sauce pan with 3 cups of water. Add the tableya and lower the heat to medium low. Use a whisk or cooking spoon to stir and break down the chocolate discs. Add brown sugar and keep stirring till there are no more visible clumps. 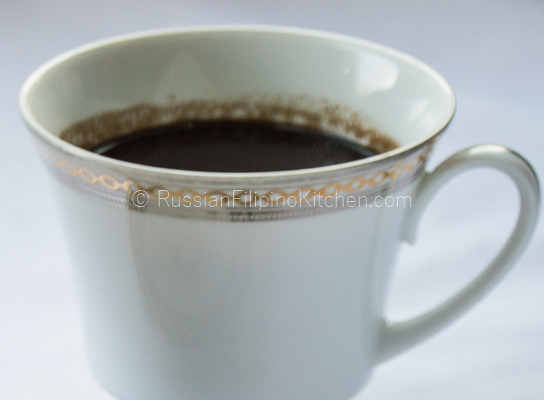 Pour into individual cups and serve hot. I went crazy when I saw this!!!! I miss miss miss this. We grew our own cacao trees as Talisay and we made our own tableya. Nothing like the real thing. Me too! 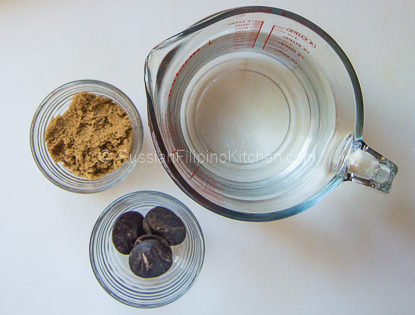 My mama used to make pure tableya from “sinanlag nga cacao seeds” too! When I was a kid I used to watch her ground those seeds in a machine and I remembered being fascinated not only by the aroma but also watching the thick, chocolatey stuff coming out of the grinder. It was one of my favorite childhood memories. we use to eat this when we went on vacation with my grandchildren in Amlan Negros Oriental. lami kaayo! That’s right. It’s comfort food at its best! I am so glad I found this. I am from Argao, ingredients are abundant. When I was pregnant with my second baby, I had cravings for this for months. Now that I am breastfeeding I crave this every morning and I go crazy with the hunger at 4am. No puto here satrisfies me, I can’t wait to try this and perhaps tweak this recipe a bit… extra sweet! More power Mia. Thanks, Sheryl! So glad to meet a fellow Cebuano! Anyway, I hope you enjoy this puto maya recipe paired with sikwate. 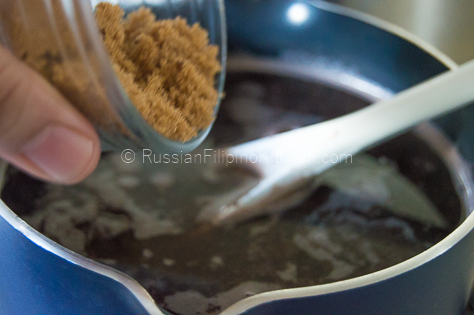 The tableya I used in this post is actually from Argao and it is one of the best I tried! Hello! That is something I haven’t tried yet. 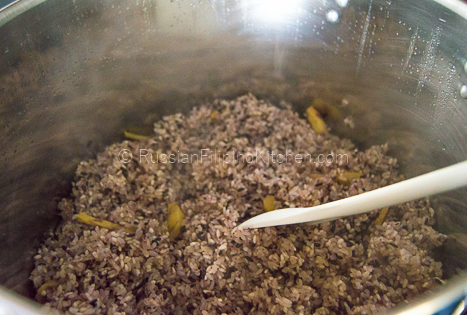 In Cebu, I only know one method of making puto maya, and that is to use a steamer. So if you use a pot, does it turned out similar to biko but less sweet? Just wondering if it’s still good. Yes, that’s how I remember our sikwate when I was growing up, too! Did you use “batidor” or “boloneo” to make it frothy? I still have to find that tool over here where I live.